In 1936, the family moved to Edmonton and Eva and her sister went to a regular school. Eva was an excellent student. In the spring of 1938 the family returned to Sunset House. After walking to High Prairie for her mother to receive her Canadian Citizenship certificate, Eva’s brother. Ken, was born. In June, Eva wrote the grade eight departmental exam and completed her education. That fall, Eva moved to High Prairie to work. She sent money and clothes back to her family. Eva enlisted in the RCAF (WD) and graduated at the head of her photography class. She also completed high school. 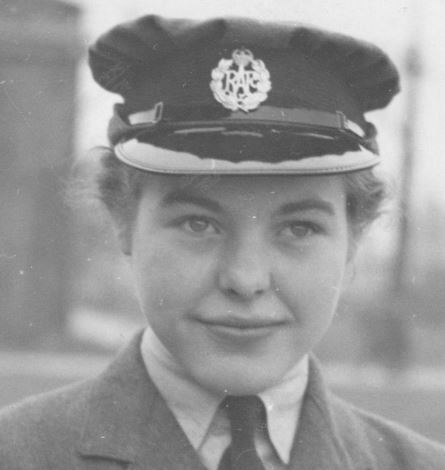 Eva spent the war in Rockcliffe, Ontario, working in air mapping. After being honourably discharged, Eva worked as a pattern and style designer in the textile industry and at the time of her death in 1977, she was teaching at Sheridan College in Oakville, Ontario. Eva passed away on January 20, 1977 at MacMaster Hospital. She was predeceased by her husband, Ted Murray. Nick was born in China (probably Manchuria) to Russian parents in 1911. He had some early lessons in English at the YMCA in Harbin. The family immigrated to Canada to take up land from the CPR in 1924 and settled originally in the Ponoka area. Nick apprenticed to a butcher and learned English from the butcher’s wife. The family moved to Spirit River and Nick followed in 1928, finding work with a butcher. He moved to Peace River in 1930 to manage a meat market. There he met Elda Searle, a teacher, and they were married in August, 1932. This was followed by a move to Beaverlodge where Nick opened a butcher shop. Their son, Jack was born in 1936. In 1939, Elda became sick and passed away. This eventually led to Nick selling the business, taking his son to his sister-in-law in Trail, and then enlisting in the Air Force in Calgary (1940 or 1941). Nick was posted overseas in England, Belgium, France, Holland, Germany and Denmark. He was commissioned overseas and worked as an interpreter for the Russian Air Force, the RAF and the RCAF. Nick claims to have spoken seven languages including Cree. He was discharged when he returned to Canada in 1946. Nick returned to Beaverlodge where he again opened a butcher shop. He married Eleanor Jarvis in 1947 and had four more children. Everett Nash was born on September 14, 1914 and he came to the Northfield Settlement area in 1934 where he worked until enlisting in the Canadian Army in June, 1942. Everett served in the 7th Battery, 2nd Field Regiment Artillery. He was stationed in Sicily and Italy until he was wounded and sent back to England. While in England, Everett met his future wife, Kitty. They got married in England, and she arrived in Northfield in July, 1946. Everett and Kitty homesteaded until 1961, when they sold out. Then they became caretakers of the LaGlace School until 1965, when they left Northfield and LaGlace. Harry Nellis, the son of L.J. (Moose) Nellis, was born on March 15, 1920 on the farm in Bezanson. When Harry was six, the family moved to Grande Prairie where he started school. They moved back to the farm in 1933 where Harry went to school for two more years. On October 3, 1940, Harry enlisted in the Canadian Army. Three of his brothers had enlisted in the Air Force. Harry learned trade-school mechanics while in basic training in Edmonton. In 1941, he went overseas and was stationed in England. There he met Grace Taylor, and on August 28, 1945, they were married at St. Peter’s Parish, Walton On The Hill. England. Harry returned to Canada in 1945 and Grace joined him in 1946. Harry and Grace had three sons. Harry worked on the farm and in the winters at Moon’s Sawmill in Crooked Creed. He lost an arm in an accident at the saw mill in 1951. Harry also worked at the Bezanson Service Station and for the County of Grande Prairie. Harry passed away on May 9, 2005. Orval Nellis was born in 1912 in International Falls, Minnesota. He moved to the Grande Prairie with his family in the spring of 1917 where his parents homesteaded until 1926 when they moved into Grande Prairie. Orval married Irene Bulford on July 15, 1940 in Berzanson. The couple lived in the Bezanson area, where their first child was born. In May, 1943, Orval joined the Air Force as an engine mechanic and they moved to Hamilton, Ontario where a second child was born. Irene moved back to the Bezanson area in 1944 until Orval was discharged on April 7, 1946. Orval took a welding course and worked as a welder until 1974. In 1949, they bought their first home in Grande Prairie. They moved to Dawson Creek in 1966. In 1974, they bought the Wembley General Store. Orval passed away in 1987 and is buried in the Glen Leslie Cemetary in Bezanson. Robert Ernest (Ernie) Nelson was born on March 4, 1925 in Grande Prairie and had four brothers; two older and two younger. The Nelson family lived in the Forbes House, a provincial historic site in Grande Prairie, from 1936 to 1947. Ernie’s father, Isaac Nelson, co-owned the Nelson & Archibald General Store where Ernie spent some of his summers working. As a child, he attended Montrose Elementary Public School and then went on to attend the Grande Prairie High School. At the age of 17, Ernie Nelson (R212423) decided to join the Air Force and trained to become a rear gunner. Once overseas, he had advanced training. He was posted to 429 (Canadian) Squadron, stationed at Leeming, Yorkshire. Just before leaving on his last operation, on November 20, 1944, Ernie received his promotion to Pilot Officer (J92597). The next day, Halifax # MZ377 left the base in Leeming, England, at 15.46 hours for a raid on Castrop-Rauxel, located in the Ruhr Valley, 5 miles north west of Dortmund, Germany. The target was the oil refinery. After climbing to 18,000 feet, they set course, went over London, crossed the channel and French coast. Two minutes from the target, at 19.30 hours, over Langenburg, Germany, they were illuminated by a single searchlight. A night fighter, directly underneath, spotted them and opened fire. Ernie, the rear gunner, opened fire and the enemy aircraft, a JU-88, burst into flames above and to starboard. They continued on to the target. After releasing the bombs, the pilot gave the order to bale out. Ernie turned in his seat, opened the door and jumped out. The aircraft went completely out of control. The port wing dropped off at the root. The pilot, hearing no response from the crew, looked into the nose to see an opened parachute. The crew could not get out. At 400 to 500 feet, the aircraft went onto its back. The pilot was thrown out and landed less than 50 feet from the plane, badly burned. The plane exploded over a house in Langenberg, Germany and landed in the garden. The house is still standing today, in 2005. The bomber burned fiercely upon impact, killing the remaining crew members trapped inside. Ernie broke a bone in his foot when he landed. He became a Prisoner of War (PoW no. 1254) at Stalag Luft VII (Bankau) and remained a PoW until the end of the war. Ernie returned to Grande Prairie and died in Edmonton on October 15, 2004. Frank was born Born Dec 1923 at St Thomas Ontario. Regimental #A105718, Unit 2 Medium RCA. Enlisted July 1942. Discharged Feb 1946. Served Canada, England, Italy and NW Europe. Rank: Private Service No:M/104929 Regiment/Service: Canadian Scottish Regiment, R.C.I.C. Notes: Son of Paul and Annie Newman, of Grande Prairie, Alberta. Branch: Royal Canadian Ordinance Corps. Regimental #M17171. Unit PROVOT Corp. Born April 6 1918 at Clairmont. Enlisted April 3 1940, Discharged Aug 1 1945. Served in Canada England NW Europe. Died May 24, 1986 at Grande Prairie. Filed in Township 79-26-W5, 1959. Ted Oatway was born June 15, 1920 to Jack and Anna Oatway who had settled in the Kleskun Lake district. Ted grew up there and attended the Kleskun Lake School. Ted enlisted in the Canadian army during the war and served in Italy and Holland. After the war, Ted settled in Edmonton and worked for Canada Post. In 1951, he married Betty Emes and they had four children, two daughters and two sons. Ted passed away November 22, 2009 and is buried in Evergreen Memorial Gardens, Edmonton. Born 1923. Died in Watino 1946, buried in Burnsland Cemetery, Calgary. Served in the Service Corps in England. Died in 1963, age 46. Lived in Valhalla, attended Molde School. Served in WWII, from Valhalla. Regiment	Canadian Scottish Regiment, R.C.I.C. Alex Pandachuck was born to Nicolas and Eugenia Pandachuck in Regina in 1924. In 1928 the family moved to the Elmworth district where they farmed. 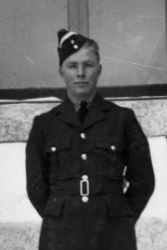 In 1942, Alex joined the Royal Canadian Air Force and in the spring on 1944 was posted overseas in England. He completed 32 operations as a mid-upper gunner in Halifax bombers. Alex met and married his wife, Margaret, while in England. When they returned from overseas in 1946, they moved to Elmworth and took up farming. Alex also drove a school bus. Walter Pandachuck was born to Nicolas and Eugenia Pandachuck in 1920. In 1928, the family moved to the Elmworth district to farm. Walter enlisted in the Canadian Army in 1941 and was posted overseas. He returned to Canada in 1946, married Mary and began farming in Elmworth. Mary taught school in various places in the area. Walter passed away in 1996. Born Oct 5, 1917 Drumheller, Alta. Enlisted Feb 1941. Unit 1st Medion RECT RCA. Served in Canada, England, Italy, NW Europe, invasion of Sicily. Discharged Jan 1946. Charter member of the Eaglesham Legion, Sept 8 1947. Filed in Township 77-26-W5, 1947. Died June 8, 1980 Burial Eaglesham RC Cemetary. Paul Paziuk was born in Wayne, Alberta May 1, 1919, Round Hill, AB. Enlisted June 1942. Regimental #M102574. Disharged Nov 1943. Served in Canada and England. Charter Member of the Eaglesham Legion, Sept 8 1947. Filed in Township 77-26-W5, 1946. Basil Peace was born on February 6, 1910 in Firth, on the Orkney Islands. In April, 1929, Basil immigrated to St. John, New Brunswick, landing there on March 23, before travelling to Deloraine, Manitoba to look for work. Basil arrived in the Peace country in 1930 to work on the railroad. He worked on the line from Hythe to Dawson Creek. On December 21, 1933, in the Red Deer area, Basil married Mabel Pollitt (also from the United Kingdom). They worked in the Albright area. They had two sons. 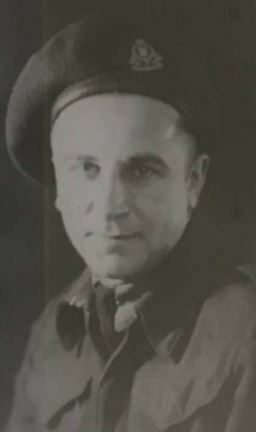 In November, 1941, Basil enlisted in the army at Calgary. He returned to Albright in time for Christmas, 1945. Through the VLA, Basil bought land in Albright and began farming. Basil Peace passed away in 1997; his wife passed away in 2013, age 103. Served in Italy, Sicily & the Western Front. Regiment: Lord Strathcona's Horse (Royal Canadians), R.C.A.C. Brother Charles was killed in action in 1943. Frank married Mary Mable Pantel on January 20, 1941 and they had two daughters and a son. 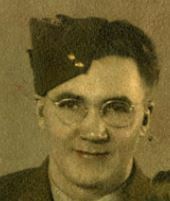 Frank enlisted in the King’s Own Rifles Regiment on October 11, 1942. He took basic training at Camrose and Moose Jaw. He was then sent to Debert, Nova Scotia but was not sent overseas. Someone in his barracks got the mumps so everyone was isolated for 21 days. Another soldier also came down with the mumps so the isolation lasted longer. In May, 1945, Frank and others from Debert were sent to Halifax to help suppress the VE Day riots. After the war, Frank moved his family first to Gundy and then to the Slave Lake/Kinuso area where they lived until moving to Grande Prairie in 1961. Frank passed away November 4, 2009 and Mary April 1, 2014. Taken by the Germans and was a prisoner of war for four years. Ralph was born in Oklahoma in August, 1908. He came to Canada with his parents in 1909. They settled at Beaverlodge and he attended school here. In 1932 he married Kathleen Clarke. They had a son and a daughter. On April 1, 1944 he enlisted in the navy as a Shpt. 4th Class. He was serving on board the mine sweeper Esquimalt when it was torpedoed, just outside of Halifax, at 6 a.m. April 16, 1945. The ship sank so quickly that none of the sleeping day crew was saved. Notes: Son of Clarence O. and Mina R. Pool, of Beaverlodge, Alberta; husband of Kathleen E. Pool, of Edmonton, Alberta. Rene was born May 27, 1918. Enlisted Dec 5, 1941. Regimental #M39501 Discharged May 1945. Served Canada England and NW Europe. Wounded. Regimental #M67419. Born Aug 9, 1909. Enlisted Edmonton Reg. Dec ?. Served Canada, England, Italy NW France. Filed in Township 79-24-W5, 1954. Died Oct 9 1978. Jim Porterfield moved to the Spirit River area from Dauphin, Manitoba, with his family in 1928. Where they took up farming in the Broncho Creek district. Jim attended school at White Mountain and then at Broncho Creek. In 1941, Jim enlisted and received his initial training in Grande Prairie and then at Shilo, Manitoba. In November, 1941, he was sent to England for more training. In July, 1943, Jim was part of the invasion of Sicily with the First Division Artillery. In December, Jim was wounded at Ortona and returned to England and then by the hospital ship, Lady Nelson, to Canada. He was in hospitals in Calgary and Edmonton. In 1946, Jim returned to Spirit River and took over his parents’ farm. He married Elsie Collins from Blueberry Mountain on June 28, 1947 and they had a daughter and a son. In 1956, Jim took over the Massey Ferguson dealership in Spirit River and moved to town, keeping and farming the home quarter. He sold the dealership in 1964 and worked at various places until returning to the farm in 1975. Spent 643 days "on the high seas"
Sports and news commentator for radio station CFGP in Grande Prairie. Bill Purves was born in Scotland. He had one brother, George. When his mother died, his father, William Purves, married Sarah. More children followed, including Jimmy, John (Jock), Henry, Agnes (Nan), Michael (Mick) and Bob. In 1926, the family moved to Canada, arriving in Montreal on May 1, 1926. From there, they came by train to the Peace country and settled in East Kleskun. In 1939, Bill was one of the first to enlist in the army, joining the 49th Loyal Edmonton Regiment. His brothers, Jock and Jimmy followed. When Bill got out of the army, he took up farming. He married Anna Jantz and lived near Hythe. Jimmy Purves was born in Edinburgh, Scotland in 1919. In 1926, the family moved to Canada, arriving in Montreal on May 1, 1926. From there, they came by train to the Peace country and settled in East Kleskun. Jimmy joined the army in 1941, enlisting in the artillery. He served in Italy, France, and Germany. When Jimmy arrived home, he worked for farmers. In 1948, he married Jean Housman and rented his parents land. Later he bought land in Teepee Creek. When his wife had a heart attack Jimmy went with to Edmonton while Jean had open heart surgery, He was killed December 16, 1966 when hit by a hit-and-run driver. Jimmy’s older brothers Bill and Jock also served in the army during WWII. John (Jock) Purves was born in Hagsbrae in Gorebridge, Scotland on November 8, 1920. In 1926, the family moved to Canada, arriving in Montreal on May 1, 1926. From there, they came by train to the Peace country and settled in East Kleskun. Jock’s brother Bill and Jimmy also served with the army in WWII. From Kleskun Hill joins the Calgary HIghlanders 1939. Werner Quassowsky was born in East Germany (now part of Russia). In 1935, he enlisted in the German army and spent two and half years in training, then returned to his parents’ farm. In 1940, he was called up. Werner fought for 10 days in France and later in Russia until 1945. Werner was hurt in an explosion and sent by boat to Denmark. When he was sufficiently recovered, he was released and walked back to Germany, first to the English zone and then to the American zone where his parents had been relocated after being expelled from their land by the Russians. Werner worked first as a farmer and then as a coal miner. In 1953, he immigrated to Canada, landing in Quebec and then taking the train to Rycroft. He found work building highway 49 and had various other jobs. He filed an a piece of land in the Bay Tree area which he homesteaded, using compensation money from the West German government to help clear the land. In 1977, Werner has a hip replacement. In 1979, he broke the hip and had to give up farming. He passed away in Hythe on December 30, 1990. Member of the first contingent from Grande Prairie, D Company, C.A.S.F. Walter Robertson was born June 20, 1906 in Forfar, Scotland. Poor wages and lack of opportunity brought Walter to Canada. He arrived in Saint John, New Brunswick on March 17, 1924 and travelled to Windsor, Ontario. He worked in the Windsor-Detroit area until the onset of the Great Depression in 1929. He then moved to the Clairmont district where he worked on various farms. With the outbreak of war, Walter enlisted in the Canadian army. He served with the Royal Canadian Engineers, 13th Field Company in England, Sicily, Italy, France, Belgium and Holland. While stationed in England in 1941, Walter met Amy Elsie Hardock, a nurse at the Richmond Hospital in Surrey, England. They were married on October 10, 1945, in Putney in London, England. Walter returned to Canada in December, 1945 to be discharged and bought land in the Clairmont area. Elsie sailed on the Queen Mary and landed in Canada May, 1946. She arrived at Clairmont by train June 4, 1946. They farmed until 1959 when Walter joined the Corps of Commissionaires and worked as a by-law officer in Grande Prairie. They moved to Grande Prairie in 1970 and Walter retired in 1972. Elsie passed away in 1979 and Walter on June 18, 1987. They are buried at the GlenLeslie Cemetery in Bezanson. In 1944, Percy enlisted as a Private in the Canadian Army. He was discharged in 1946 with the rank of Lieutenant Corporal. He returned to Huallen to farm and work on the family farm. Worked for the Canadian Intelligence Service. Was in the Air Force in WWI. Served with the American Medical Corps in North Africa and Italy. Service No: M/105982 Regiment/Service:Royal Hamilton Light Infantry, R.C.I.C. Lived in the Northmark district. Married: Sarah Geffin April 9, 1941. Norman served in Italy, Sicily and Belgium on the front lines. He was attached to the first Armoured Tank Corp out of Calgary and was in the 2nd landing to hit the beaches of Sicily, the first wave was wiped out. Norman served as a truck driver and a foot soldier. Norman died December 20, 1982 and is buried in the Grande Prairie Cemetery.